It is no secret that I have relied on prayers during this entire journey. Therefore, when I had the first opportunity to read 31 Days of Prayer During Infertility, by Lisa Newton, I jumped at the chance. I have read several devotionals about infertility. This is definitely my favorite. A couple of years ago, Lisa took a challenge to blog everyday for 31 days. Those entries turned into her first rendition of this book. The book is laid out as a chapter per day. 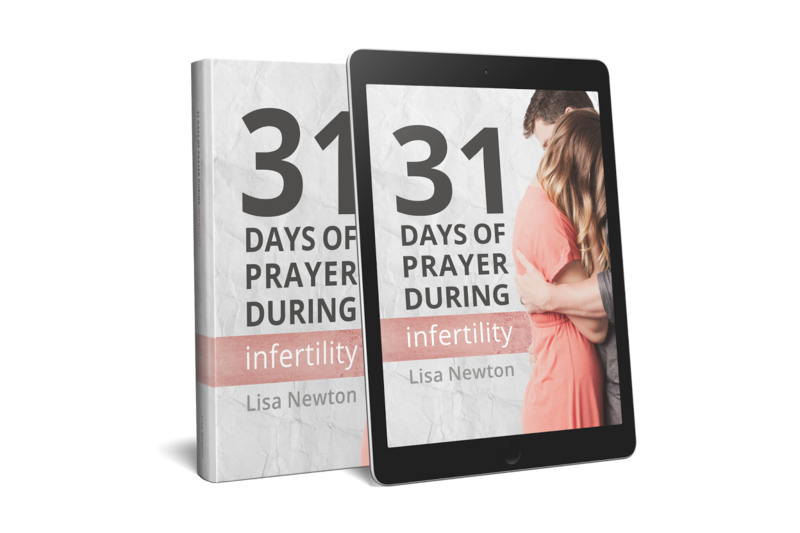 Each chapter is a different topic that we should pray about in the midst of our infertility. The 31 topics that she chose are every fear that I ever felt during my journey. There isn’t one topic that I would add. The chapters start with something to read, either a personal story from Lisa or quotes from others interlaced with Bible verses. So many of the personal touches that Lisa adds hit home for me as they are thoughts or stories very similar to my own. Then, there is a section where you can answer questions pertaining to the topic, write-out Bible verses, and conclude with a written prayer, tying all of it together. There is plenty room for journaling on these pages, which I really appreciated. Plus, I thoroughly enjoyed actually writing the verses because it gave me a chance to focus more deeply on them, learning what they were saying to me in that phase. The way the devotional is laid out, you can even jump days if a different topic is speaking to you on a certain day. That is something I have done each time I read this. It’s fun to see where I’m going to be called each time I open the table of contents. I first read this study when I was in the midst of my infertility journey, and it truly helped me to find the words to more clearly pray through my pain and confusion. I have read it, again, since we have started accepting our new path after fertility treatments. It has allowed me to start processing what life may look like moving forward. The truth is, scripture pertains through every season of life. Lisa gave me an outlet for being able to find how scripture can mean something different to me at each step. I am thrilled that this book was released this week on Amazon in print and in a Kindle format. I wish I could give a copy to every woman I know that is in the midst of a wait. It’s brilliantly laid out, and I look forward to continuing to read it through more phases of my life. You want to know an added bonus?! Right now, this book is only $7.99 for print or $0.99 for Kindle on Amazon. Hurry though because these prices won't last past Sunday, August 14. You can find Lisa’s book for sale on Amazon. In order to say thanks for buying the book now, there are some special bonuses that you can get, but only if you buy the book from Amazon by Sunday, August 14. · Purchase the print book for $7.99 or the Kindle book for $0.99 from Amazon between now and this Saturday, August 14. They're both on-sale at their lowest prices now, and the prices will go up after August 14. · Forward your Amazon receipt OR the screenshot of the purchase confirmation screen to Lisa by emailing it to lisa@amateurnester.com by Monday, August 15. Please put "31 Days Bonus” in the subject line. You’ll receive an email from Lisa with your bonuses! If don't receive the email within an hour or so, please check your Spam folder. If you still haven't received it, you can try emailing her again or messaging her on Facebook or Twitter. Hi, Laura. I posted back in April of 2014 to let you know about the three cycle program available through CCRM. At the time I just had a failed transfer eith my one normal and was kicking myself for not following my gut and sticking to the three cycle plan. Well sbout a year later we opted to move forward with the three cycles and I know have a 2 month baby boy. If you are through with cycling and have found your peace I understand but if not the door has not been closed. Wishing you love and peace in whatever path you choose. Thank you so much for taking time to read and leave a comment. We actually discussed the FBP with Schoolcraft a lot during our cycle with him. However, he doesn't seem to think that will make much of a difference with my egg quality and our sperm issues. Plus, six IVF cycles have kind of done us in on fertility treatments. We are at peace with waiting for our new plan from God. I am so glad that worked out for you, though. Congratulations!